In January-August 2018, seaports of Russia handled 535.6 million tonnes of cargo (up 3.4%, year-on-year), says press center of the Association of Commercial Sea Ports. Transshipment of dry cargo totaled 258,7 million tonnes (+7.6%) including 107.8 million tonnes of coal (+4.9%), 37.0 million tonnes of grain (+45.1%), 35.4 million tonnes of containerized cargo (+11.9%), 20.4 million tonnes of ferrous metal (+8.7%), 11.6 million tonnes of mineral fertilizers (+1.4%), 3.6 million tonnes of timber (+5.4%), 2.8 million tonnes of metal scrap (+15.7%) and 2.5 million tonnes of non-ferrous metal (+1.0%). Transshipment of liquid bulk cargo totaled 276.9 million tonnes (-0.1%) including 162.1 million tonnes of crude oil (-4.5%), 97.4 million tonnes of oil products (+2.4%) and 13.8 million tonnes of liquefied gas (+46.0%). Exports totaled 412.7 million tonnes (+3.3%), imports - 24.4 million tonnes (+2.0%), transit – 42.2 million tonnes (+9.5%), short-sea traffic – 56.4 million tonnes (+1.0%). Operators of seaports in the Arctic Basin handled 53.9 million tonnes (+10.8%, year-on-year) including 34.1 million tonnes of liquid bulk cargo (+15.5%) and 19.8 million tonnes of dry cargo (+3.6%). The port of Murmansk handled 35.6 million tonnes (+4.1%), Arkhangelsk - 1.9 million tonnes (+22.9%). Operators of seaports in the Baltic Basin handled 162.6 million tonnes (-1.2%) including 90.4 million tonnes of liquid bulk cargo (-6.1%) and 72.2 million tonnes of dry cargo (+5.6%). The port of Ust-Luga handled 64.5 million tonnes (-4.5%), Primorsk - 35.8 million tonnes (-10.8%), Big Port St. Petersburg - 39.4 million tonnes (+11.7%), Vysotsk - 12.1 million tonnes (+2.7%), Kaliningrad - 9.7 million tonnes (+8.0%), Vyborg - 1.2 million tonnes (+22.9%). Operators of seaports in the Azov-Black Sea Basin handled 182.0 million tonnes (+5.3%) including 80.5 million tonnes of dry cargo (+10.9%) and 101.6 million tonnes of liquid bulk cargo (+1.2%). 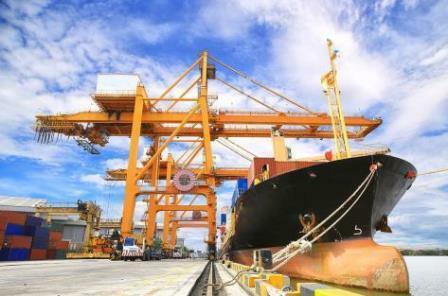 The port of Novorossiysk handled 103.2 million tonnes (+6.7%), Rostov-on-Don - 11.3 million tonnes (+26.7%), Temryuk - 2.4 million tonnes (+31.3%), Taganrog - 2.0 million tonnes (+14.1%), Kavkaz - 20.3 million tonnes (-5.8%), Tuapse - 17.2 million tonnes (-3.5%), Taman - 8.7 million tonnes (-12.3%), Kerch - 5.6 million tonnes (-7.9%). Operators of seaports in the Caspian Basin handled 3.3 million tonnes (+36.2%) including 1.8 million tonnes of dry cargo (+6.6%) and 1.5 million tonnes of liquid bulk cargo (up 2.1 times). The port of Makhachkala handled 1.7 million tonnes (up two-fold), Olya – 280,700 tonnes (2-fold). The ort of Astrakhan handled 1.3 million tonnes (-9.7%). Operators of seaports in the Far East handled 133.7 million tonnes (+3.5%) including 84.5 million tonnes of dry cargo (+7.1%) and 49.2 million tonnes of liquid bulk cargo (-2.2%). Port Vostochny handled 46.8 million tonnes (+1.2%), Vladivostok - 13.8 million tonnes (+24.8%), Prigorodnoye - 11.4 million tonnes (+0.8%), Shakhtersk - 6.0 million tonnes (+41.1%), Olga - 1.1 million tonnes (+10.8%), Petropavlovsk-Kamchatsky - 1.1 million tonnes (+20.9%), Vanino - 19.4 million tonnes (-3.0%), De-Kastri – 7.9 million tonnes (-3.7%), Posiet - 5.0 million tonnes (-3.5%), Nakhodka - 16.4 million tonnes (flat year-on-year). Association of Commercial Sea Ports (ASOP) set up in 1987 unites over 50 organizations and enterprises of Russia’s maritime transport. ASOP comprises commercial seaports, forwarding and agency companies, scientific research institutes and marine educational institutions. Operational results of Russian port sector are based on statistics reports and cover all stevedoring companies operating in the Russian Federation.